Lonely in the jewelry box? Do you have a box of dated, too-tight or odd pieces of jewelry, perhaps something like the orphaned earring shown, and wonder if it's worth it remodeling? I gave boxes of abandoned pieces to a church rummage sale before the move, but others are earmarked for renos. Remodeling is only worth it if you end up with a piece you love so much you'd sleep in it. Today, some considerations about the cost of restyling; tomorrow, design and ideas. Few of us sweep into a jeweler's without regard for cost, so receive an estimate for the project, but also understand what's behind an estimate. Restyling is rarely a cheap fix. Just like a house reno, you can make smart choices to keep costs from skyrocketing. Actual costs are impossible to give, because there are so many factors, but let's tackle the matter. The jeweler must tear down the original piece without damage to the stones. 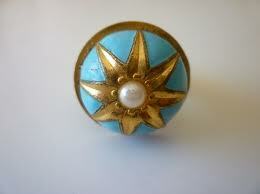 Resetting a solitaire is pretty basic, but taking a brooch like this and making a pair of earrings is extensive labour. If you are recycling metal, it has to be melted and sometimes refined. If you want a stone reset in a stock ring setting, for example, you might pay $500-$1500 depending on the weight of the mount, plus additional costs if you are adding gems. Once you move into the realm of custom settings, the jeweler must complete many more steps to cast your unique setting, and costs rise. If you bring in a necklace and want to create a bracelet and earrings, you can see how the labour escalates, and you may have to add stones. 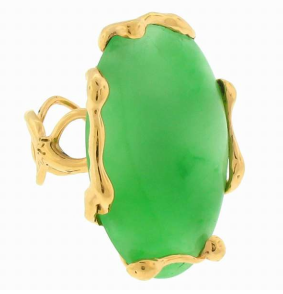 If you bring a photo of a ring like this Lucifer Vir Honestus jade and ask for "a setting like that", your jeweler has to attempt a near-copy, which she may never have done before. Even if she has the capability, there's an elusive artistry from the hand of the creator. I've seen so many copies fall short of a photo. I've seen more successful restyles when the customer finds a jeweler she likes, and works within that aesthetic. Ask not only to see a portfolio of remodeled work, but also the actual piece when possible ("before" and "after" photos). This is not because you don't believe the photos, it's because feeling the piece in your hands is quite different from the photo. Behind the jeweler is a small army of artisans; few jewelers do everything themselves. They typically employ or source work from designers, cutters, casters, polishers, stringers and setters. If you are remodeling an heirloom, the piece may have damage to stones that is invisible to the eye, but weakens the stones; they should not be reset in that condition. The stones may need recutting or repolishing. All of these considerations affect cost, which is why it's sometimes a shock to hear the price for restyling, when you thought "I already have the stones". Just like clothing designers, 'name' jewelers cost more. When you fully understand the materials and labour costs, you can assess how much you are paying for the design. Just like your house reno, spend where it shows, and stay open to ways to manage costs. Marcy owned a sapphire and diamond diamond cocktail ring that belonged to her grandmother. She wanted a modern ring that fit with her other pieces. The 2 ct. round sapphire was in good shape, and needed only to be repolished. The side stones were badly damaged diamond trapezoidal baguettes. Replacing them with two custom-cut half-carat stones would cost $5,000. Marcy's jeweler suggested replacing the baguettes with pavé instead, which cost $1,000. He showed her the difference by making a wax cast and placing an old baguette on one side, the temporary pavé on the other. The pavé was a 'blingier', more modern look, which Marcy preferred. Total cost of the project was $2,500. Using white gold instead of platinum, or casting a heavy ring so that the back is hollow reduces the cost of precious metal. You might also reduce cost by using less expensive materials, such as tourmaline instead of emerald or ruby, white sapphire instead of diamond. Ask to see a range of gems in the colour you're using. My friend Alice bought a magnificent set of imperial topaz stones chosen in Mumbai by her daughter. She took them to her jeweler, Don, who designed a stunning yet simple necklace. Alice's husband, Jean, unaccustomed to buying much jewelry, freaked out at the cost, so she asked Don for a second design, using less gold. 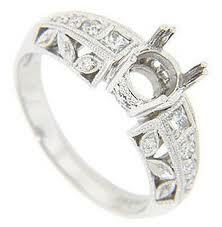 The second design was pretty, but didn't show the stones' beauty like the first. Jean could see the difference and came around. The necklace is gorgeous on Alice, and she is thankful every day that she didn't cut corners. The right setting, at last! Le Duc gave me a small princess-cut diamond 25 years ago. Though I loved his gift, I never really liked the setting, and five years later had it reset. That jeweler didn't scale the setting to the stone, and I was too inexperienced to ask him whether he would. The diamond looked lost, surrounded by too much metal. Another five years passed; in a small jeweler's shop in Montreal (Bijouterie Arto), I saw a similar diamond set just the way I wanted. (Small stones can be more of a puzzle than large.) This time I got it right; my ring reminds me that mistakes can be corrected. Though I could almost have purchased another ring for the price of the two resets, that stone is sentimental–so it's worth it. Your ring is my favorite of all the pieces shown or described:). And I am still considering what to do with my assorted small diamond earrings, pins, and pendants. I don't wear pins, so it'd have to be a necklace or earrings. Either way, so much skill required I'm hesitant. But I hate to sell jewelry, never have so far. Just thinking, considering what to do. LPC: Perhaps you might gypsy-set them (for those unfamiliar, the setting looks like the stones are pushed into the metal), scattered on a wide cuff. 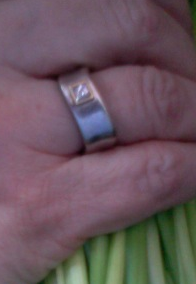 When Wendy was reworking my ring, she found that some of my old stones were too chipped to re-set. Trying to match the center stone (old mine-cut, and a bit yellow) would have been impossible, so I bit the bullet and replaced all of the stones. I kept the "spirit" of the original diamonds by replacing with the same number and sizes, if not the actual stones. It cost me, but I know I'm MUCH happier than I would've been with either fewer or mis-matched stones. And at some point we're going to do something fun with the few original stones that were still usable. Duchesse, I love the ultimate ring with the princess diamond. It's very sleek! Sort of Alexis Bittar-like, only real? That might look just gorgeous. Hmm. My sister in law had her diamonds set into a molten abstract blob of gold after her divorce...her diamonds were stunning and large and she felt that they would still be a great accessory and didn't want them buried in her jewelry box. In fact she provided all the gold from other bits and bobs that she had received over the years and discarded as too dated. 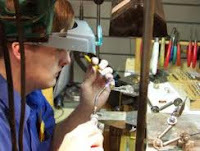 It sounds like you are well on your way to forming a great relationship with a fine craftsman and jeweler! Montreal must have other hidden gems. waiting..
keep us in the loop on your new discoveries Duchesse! I have had quite a few pieces of my jewellery re-modelled over the years and have always found it worth the investment. I hate having things in my jewellery boxes that I don't wear. I inherited some pieces from my mother that were not really my style. A very chunky and heavy charm bracelet I divided into 2 and gave one to my daughter. Luckily I have a very good jewellery; which reminds me he is currently restyling a single earring (it's partner got lost) into a dress ring. thanks so much for all your important info. LPC: I've e-mailed you a photo. Pseu: For another story that shows it's worth doing right see Part 2, tomorrow. And your ring is fabulous! Hostess: Arto was discovered in Montreal, but...15 years ago. If I had a serious reno project I would talk first to Artworks Gallery in Toronto, whose work is world class. Chicatanyage: Inherited pieces are both excellent candidates and sometimes the hardest (emotionally) to give to restyling. An earring into a ring is often a most satisfying project and I hope you will show us. Beatnheart: Thanks and feel free to add your observations, perhaps tomorrow in Part Two. What a wonderful post and a reminder that I too have a bunch of small stones and pieces that I don't wear that I would like to have reset. I'm not sure I want to sell the jewelry, and once again, even from the comments here I am seeing options. I love your ultimate ring, it looks just perfect. I am reminded of how happy I am with my own reset stone. It took us years to find the right thing and then the setting I wanted couldn't be done with my stone so we sent my stone to the designer to have the ring made for it. It was well worth the expense as I now adore the ring, and it is still the same original diamond and that makes me very happy. Your ring is beautiful! Thank you for this informative post. I very much admire Susan's ring but I think I would be happier with one like yours. Now I'm thinking about the gypsy setting as an alternative. The cuff with scattered diamonds sounds wonderful. Mardel: Sometimes it takes running across a jeweler who's work you love to motivate you to dig the things out and make them wearable. Susan Tiner: Thanks; I'll show the cuff tomorrow, encouraged by LPC's request. Despite the costs of remodelling an old piece, I'd probably bite the bullet too. I love the idea of recycling old heirloom and personalizing it to fit my taste and the more modern, sleek designs of today.